Once you have decided on buying a boat you will need to think about where you are going to store it. If it is not possible to store at home then you will need to moor your vessel. 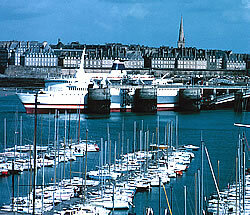 There are several types of moorings available and these include a marina/harbour, boatyard, or a swinging mooring . A brief description of each one is given below with a guide as to how much they will cost in the South of England. Prices are cheaper in other areas of the UK. Remember to always check the actual cost with your chosen mooring company as prices do vary alot. 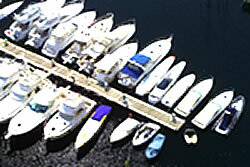 Marinas are the top of the range as far as moorings are concerned. Moorings in a marina tend to provide deep water throughout the day and therefore a jetty or pontoon is provided so that you can walk to your boat without getting wet.These are known as Pontoon Moorings. They will also provide most of the facilities that you require whilst using your boat. These may include showers and toilets, chandlery, parking, cafe and even a clubhouse. The security provided by a marina will be good and in many cases will include electronic access gates and CCTV camaras. A boatyard tends to be used by people who wish to refit or repair their boat whilst it is not on the water. They can also be used in some cases for winter storage if your boat has been on a swinging mooring in the summer. Many boatyards have their own workshops and will carry out repairs on your behalf. Facilities may not be as good as those in a marina, although with a greater provision for residential moorings the standard won't be bad. Swinging moorings tend to be the cheapest way of mooring a boat, although some sort of winter storage may need to be considered. Swinging moorings are provided in rivers, estuaries, harbours or in other areas of sheltered water. They consist of a buoy which is attached by chains to a heavy sinker which lies on the river or sea bed. Your boat is attached to the buoy and will then swing around in the water according to the direction of the tide - hence the name. To get to your boat you will need to use a small craft like a dinghy or inflatable tender.A mooring in a tidal area will probably mean that the boat is high and dry for some period of time and it is wise to choose one which will sit down comfortably, probably on bilge keels. If you choose to moor your boat in tidal water then you may come across the terms Mud Berth, Half Tide, and All States Of Tide. A Mud Berth is where the tide will go out and leave your boat sitting in the mud until the tide comes in again, which restricts the times as to when you can use your boat. In this case it would be worth contacting the mooring operator to find out when the best times are for using your boat. Half Tide is when the tide will be in at your mooring for about half the time of the full tide. All States Of Tide means that your boat will be afloat all of the time, moorings in these areas tend to be more expensive than the mud berths as you can use your boat at any time. The costs of your mooring will depend on the type, location, and the size of your boat. Most prices are stated per metre. The mooring costs given by a marina or moorings operator do not include moving and lifting the boat and should also be considered if you decide to store your boat in a boatyard during the winter months. For example a typical 10 metre (approx 33 feet) yacht would cost around £3500+ a year based on the information from MDL Marinas (www.mdlmarinas.co.uk/mdl-woolverstone-marina) and the Weymouth Marina www.deanreddyhoff.co.uk/weymouth. Further information can be obtained by contacting the marinas and mooring operators direct. For this purpose we have included the links to Dolphin Diving (www.dolphindiving.com)and Marina Info (www.marina-info.com).